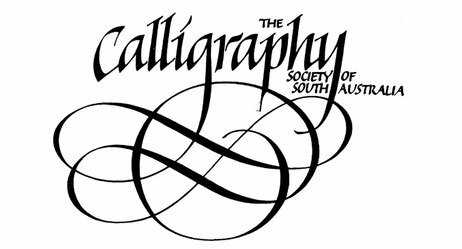 The Calligraphy Society of South Australia (CSSA) has been active since 1983 and aims to promote calligraphy and related arts such as book binding, illumination, lettering, flourishing and much more to the Adelaidiean community. On December 16, 1983 a meeting was held in the library of the South Australian Collage of Advanced Education. The meeting was attended by about a dozen people who being of like mind resolved to "form the Calligraphy Society of South Australia" with Frank Caspers elected as Chairman, Roland Eime as Secretary/Treasurer and Ruth Venner, Don Hatcher, and Kevin Keeler as Committee Members. The general tone of the Society was set by the last item on the agenda of our inaugural meeting "conversation and coffee", a tradition which continues to this day and does much to preserve and promote the friendly character of the Society.